Photos of a prototype cartridge-pcb with direct bonded BASIC 2.1 chip. EC UK was looking for possibilities to reduce production cost and GI made these engeneering samples for them for evaluation purposes. What could a simulator be like? some people were asking about the eprom simulator in the forum. Unfortunately I do not have the original one anymore, that we used from appr. 1990 onwards. However, I still have one working sample of the newer model, that we bought in 1993, to support the work of the programmers (pictures attached). The older model was much bigger and had only 128kByte (simulated eprom up to 27128). It was horrible expensive at that time, but development work got to a new level with it. The model on the pictures has 512kByte of static ram and can simulate eproms up to 27512. It is powered from the eprom socket, which it is connected to. 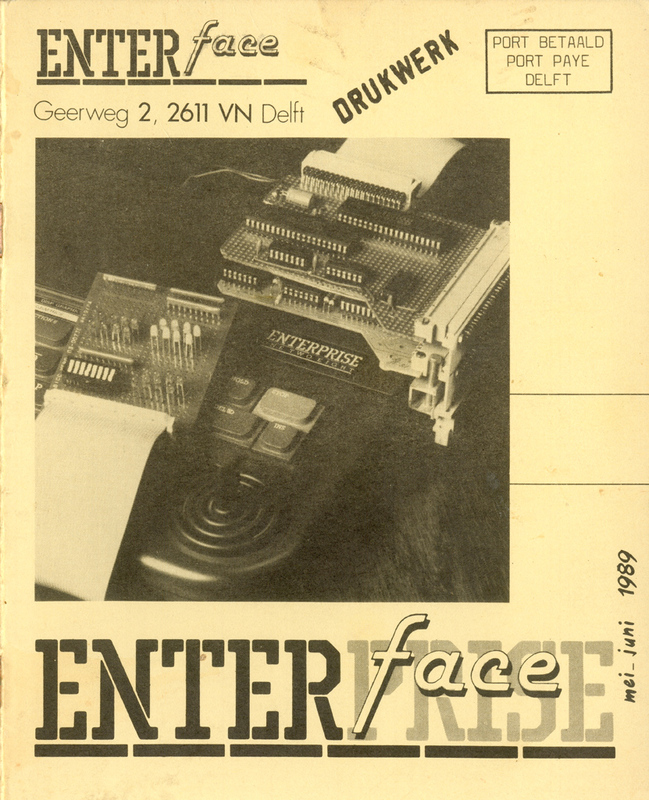 Attached the promised pictures of the very stylish-looking EXDOS-Controller from the Netherlands (Enterface 87/04-05, picture on title). It has a plastic housing and the design looks very much like being original ENTERPRISE . The mechanical structure of the expansion port socket/connector can be seen on the title of Enterface 89/05-06 but I never saw an additional expansion card for that system. The card on top of the "stack" is a prototyping card, so I believe that the EXDOS-Controller was the only professional produced board. An interesting detail is the aluminium tube within the expansion connector. It supports the structure and acts as a cooler for the 5V power regulator too. They were using the 3mm variant of "Leistensteckverbinder DIN 41612". One part was directly soldered to the expansion port, which gave a very strong connection. In my MINIBUS/Motherboard Expansion Bus I also used this kind of connector, but with 5mm spacing between the two rows. These connectors are ideal for the ENTERPRISE extension bus, because they have 64 pins (2 rows of 32 pins) and they are very well constructed. You probably know the EXDOS/Floppy-Station ("Diskettengrundeinheit") which was sold in Germany. We had a prototype for an additional drive on top of the first one and I've attached some pictures of it. This is really a one-off. It was never produced/sold in Germany or elsewhere. The single drive with it's metal case and the big switching power supply was already too expensive. It had been ordered by the first ENTERPRISE sales team in 1986 and the total number of produced drives was only around 600. In the beginning it was sold for DEM 698,00 incl. VAT. At this price nobody was interested in a second drive. The prototype suffered a little bit from being stored in my cellar for at least 25 years, but both drives are still working. With the connector on the backside of the second drive you can connect additional drives. We had two Cumana double 3.5" FDD's and showed the ENTERPRISE with four connected disk-drives in our office in Munich. I always thought the German machines and the German expansion ROM are produced by the German company. Now when I asked about the BRD ROM, the answer totally surprised me! The 08-59 EPROM and it's contents did not come from ENTERPRISE GmbH. The German ENTERPRISE 128k was the only official foreign version, which was planned, produced and shipped from England. Apart from that there were only english 64/128 machines. The contents of the 08-59 EPROM must have been produced by IS directly. I think, that the story started at a time, when Hegener & Glaser tried to sell the ENTERPRISE 64k as Mephisto PHC. They had to realize, that a pure English machine was difficult to sell, especially as they tried to sell it as a network computer (for schools, ...). Therefore the beginning of the BRD-extension must be somewhere between December 1984 and early 1985. German ENTERPRISE was founded mid 1985 and the German 128k machine was already ready at this point. About the drive units: For build these dismantle existing EXDOS cards, or used remain EXDOS PCBs? From the single drive unit only 3.5" version exist or also produced with 5.25" drives? the German Floppy-Disk-Station was produced in Germany. From England came the following parts: Complete system bus bridges, packed in poly-bags and bare Exdos-controllers without ROM (no case, just the boards, packed in cartons and individual poly-bags). The German producer took these parts and mouted them in the case, together with the power-supply and the fdd-drive itself. He had got a master of EXDOS 1.3 and did eprom-programming by himself. There were no Floppy-Disc-Stations with a 5,25" drive, only that prototype had such a drive. All other stations had the black 3.5" BASF-drive. The reason for powering the controller from the computer was simple: The existing system-bus-bridges, that they had to use (for cost reason) already had the power regulator and delivered 5V to the controller. Therefore only the drive was powered by the built-in psu. As there were no manuals coming with these exdos-controllers, German ENTERPRISE was under pressure: They rushed out a translation of the original manual and simply did photocopies of it. Some of these photocopies were very bad. The IS-DOS manual had the same size and the same quality in the beginning. The A4-sized German manuals came later, when the crew at ENTERPRISE Germany had already changed. As far as I remember it was Michael Leopoldseder (who did the Harddisc-Software later) and me who translated the original manuals again. The translation was done on an ENTERPRISE, with Wordstar 3.0 . I still have the original files in my backups. The EXDOS-Controllers, which were sold in Germany, did all come from England as a kit. These Controllers had no foam and/or carton packages. Furthermore there was also the EXDOS EPROM missing. The producer of the Floppy-Stations completed them with the EPROM, put them in the housing an repacked the stuff. That was the reason, why there were no originally packed EXDOS-Controllers in Germany. You can easily indentify these controllers out of German assembly, because the are all missing the coloured EXDOS-sticker on top. Pictures of my collection of original master ROMs for the ENTERPRISE, from ex office ENTERPRISE UK Ltd. The German ROM is one of them and we got this collection together with the other stuff in late 1986. For which purpose are used the "Dave test" and "Nick test" EPROMs? I think these used at the factory for verify the machines. Somewhere I read a article about: the EP company spent a lot of money for the quality control, and all machines verified in the factory. I asked Werner for reading out the EPROMs. It can be the rom inside this cart. Seems to be from Mr Kopecsy. And now there are some really fantastic things! I never thought that I would see them! Many-many big thanks to Werner!!! The plans were scanned in A0 with 400DPI. They are very different in size because of their different quality. The service provider did his utmost to get the best quality out of my "original" AMI-copies and I hope that everything is readable. The plans for ESPRIT do not show any revision over time. Therefore I assume, that although DAVE had revision D, this was the one and only produced version (08-05) ever. On sheet 1 of ESPRIT you can see some major changes/additions. The original drawing is dated 12.08.1983, but the sheet carries the date 04.11.1983. I think that DAVE was ready for production at this point, but it already had four major corrections up to this date. The plans for ELITE show five revisions over appr. one year of production. It is not known, when the change from version 1 (08-04) to version 2 (08-47) has taken place, but the last revision E is definitely 08-47. Unfortunately the plans show no signs of any change, so we can only assume, that there were minor, but important changes. It is a modem card, in Denmark it was used for Enterprise BBS! The card has a Z80CPU, running at 2.4 MHz, 2 kByte of static ram and a Z80DART. It is the most complex expansion for the ENTERPRISE, that I know. At least it has not more power than the computer it was connected to . The connector is exactly the same as that one used for the exdos-controller from the Netherlands. 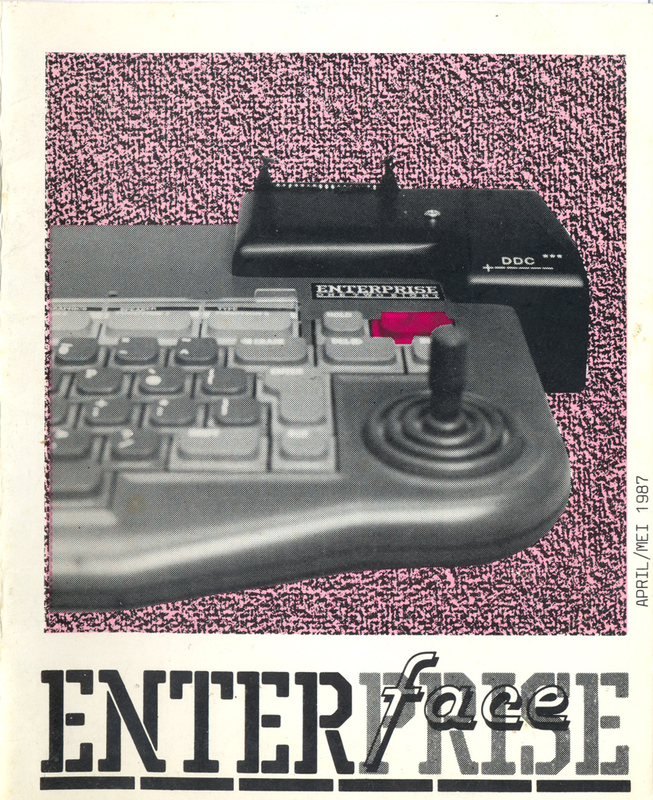 interface, the EGI (Enterprise Graphical Interface), which looks like the Atari GEM"
The only thing I can tell you in advance is, that the machine, that was mentioned in the interview with Vilmos, is pure fiction. It never existed and the details Vilmos told there were a mixture of facts from the Vulcan-Project (Model 911 or ENTERPRISE X), part of his own developments (MIDI-Interface) and some ideas, we were developing in some talks, while sitting together and having a beer. We were also talking about the 64180 cpu, but there never was a machine running with this CPU and any version of EXOS at that time. Page created in 0.245 seconds with 39 queries.